We need a wide variety of vitamins every day to enjoy good health and fitness. Each of these essential nutrients does a variety of important jobs in our bodies. So what does vitamin D do for our health and how can we make sure we’re getting enough of it? You need vitamin D in order to absorb calcium – an essential for teeth and bones. That’s why you’ll often notice that calcium supplements have added vitamin D. Just taking lots of calcium by itself won’t necessarily be of any benefit to you. You’ll be eating plenty of vitamin D when you choose oily fish dairy products and eggs. So which fish are considered oily? Look for salmon, sardines, pilchards, tuna, mackerel, trout or herring. 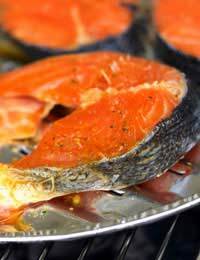 Wild salmon is particularly tasty – you’ll spot it by its dark red flesh. But if that’s a bit on the pricey side for you, sardines are readily available and cost very little. Either try the tinned variety (great on toast – just remember to eat up all the soft bones) or buy them fresh and pop them under the grill or on the barbecue – very European! Tuna is a great favourite in sandwiches and salads if you buy it tinned, but try a fresh tuna steak now and then. They take only minutes to cook – either grilled or fried – and while you’re getting plenty of vitamin D, you’ll be eating healthy omega 3 oils too. Unlike other vitamins, food and drink are not your only sources of vitamin D. In fact, the key source of vitamin day is sunlight. When your skin is exposed to the light from the sun, your body can manufacture vitamin D for itself. Who Might Need a Vitamin D Supplement? Most of the time, the best way to get all the vitamins and other nutrients we need is by eating a healthy, balanced diet. But there are some groups of people who might want to consider whether a supplement of vitamin D might be right for them? If you are housebound, or if your cultural traditions mean your body is totally covered whenever you go outside, it might be a good idea to take a vitamin D supplement as you’re not seeing much sunshine. Alternatively, bump up your intake of oily fish and eggs. Ask a health professional for advice if you’re not sure. Vitamin D is a potentially challenging vitamin for vegans as the main sources of vitamin D are all from animal products – oily fish, eggs and dairy products. But vegan margarine is also likely to contain vitamin D – and remember that sunlight is the key factor in getting sufficient quantities of vitamin D. So make sure you get outside when you can and take particular care during the darker day of winter. Because much of our supply of vitamin D comes from our exposure to sunlight, darker winter months can mean we’re not getting as much vitamin D as our bodies ideally need. During winter, not only do we see less sunshine, but even when the sun is out, many of us are stuck in our offices or workplaces. Of course, when we do venture outside, our skin is usually well covered up because of the lower temperatures. So it might be a good idea to think about your diet during winter – maybe eating a little bit more oily fish or the occasional egg from breakfast here and there to be sure that you’re getting enough vitamin D in your food. Taking a supplement is another option, but you can usually get enough vitamin D from a combination of sunlight and a balanced diet. Vitamin D is an easy vitamin to forget as it’s so unusual. We normally think about fruit and vegetables when we’re considering our vitamin intake, but for vitamin D it’s all about delicious oily fish like salmon and tuna, and the occasional stroll in the sunshine. So all in all – it’s a good news vitamin! Great for your body, and plenty of enjoyable ways to be sure you’re getting enough.